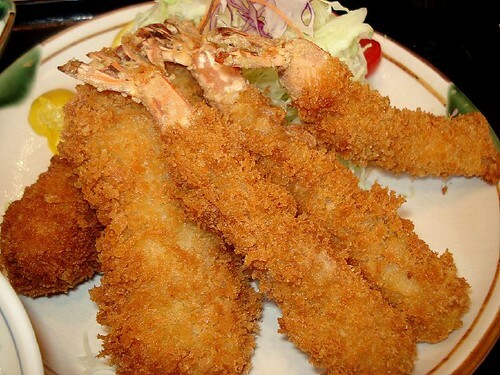 Mixed Seafood Fry, originally uploaded by Camemberu. It's tough to eat at Ngee Ann City without contending with either crowds or exhorbitant prices. But we had some Kinokuniya vouchers to burn (hurrah!) and we really missed Katsukura, the great katsu experience we had in Japan, so we chose to try Tonkichi, which is a similar tonkatsu specialist. Of course, we went with dialed down expectations. Surprisingly, they didn't give us the mortar and pestle bowl with sesame seeds to grind. Oh well, I had my hands full with baby Jolie anyway. My seafood fry (S$24) consisted of prawns, fish and crab croquette. Normally it includes a fried oyster too, but they ran out, so it was replaced with prawn (you can pick fish too, if you want). Not a bad array but the prawns were a little bit tough and the crab croquette too wet and sludgy inside. The fish was sweet though. Jumbo Katsu, originally uploaded by Camemberu. Hubby took a jumbo katsu (S$21) which comes with three sauces - salsa, oroshi ponzu and miso which on their own would be S$1 each. All the meals come with rice, pickles, miso soup and dessert (fruit). Alas, I fear Katsukura has spoiled us for all tonkatsu. 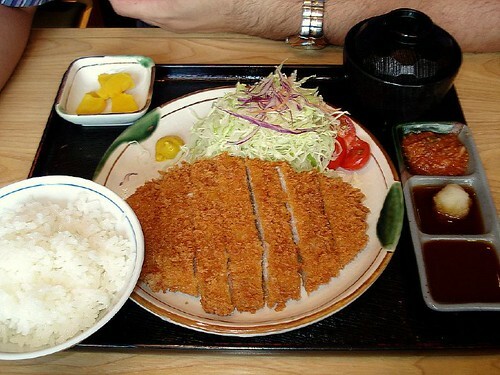 Tonkichi's jumbo katsu was huge but the meat quality paled in comparison to Katsukura's. I really don't know how the Japanese do such an excellent job and keep it so affordable still! Their tonkatsu was only about S$13! Tonkichi's batter/breadcrumb exterior was also tougher and less delicate. Even the cabbage tasted different (it's also less crisp and shredded more coarsely here). 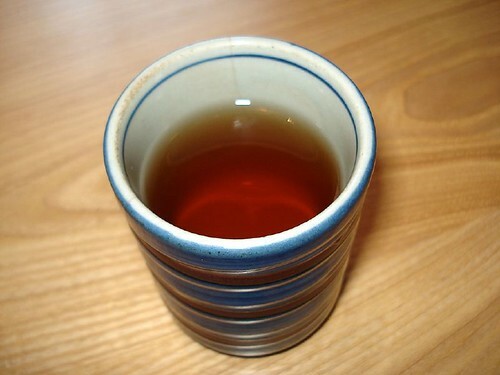 Houji-cha, originally uploaded by Camemberu. A nice touch here in the land of increasingly "no water served" - Tonkichi gives you free-flow houji-cha (roasted green tea) which purportedly has many health benefits, including helping to lower your blood pressure and blood sugar. Even though it's not the best tonkatsu we've had, it's a fairly enjoyable meal. You could make the same tonkatsu at home quite easily but you'd have a greasy kitchen to clean up afterwards. Meanwhile, I'll just keep dreaming that Katsukura will bring itself here someday. The katsu in one eatery located within Daimaru building is not bad! I forgot if it's Tonkichi! And wonder if it's still there! Tigerfish, that must be Tomton, which admittedly I have yet to try. Keropok man, haha, wait til you eat at Katsukura. Like anonymous below commented, it's artfully done and you will be hard-pressed to find the same kind of satisfaction in local katsu. Anon: yes, you've been there too? I feel all the more lucky because Katsukura was a chance find for us. yes, it's tomton. close enough to tokyo standards for me to make it a regular haunt. they have kurobuta options too. the kyushu ramen is good .